Nike is producing a special line of not-for-profit shoes just for Native Americans. 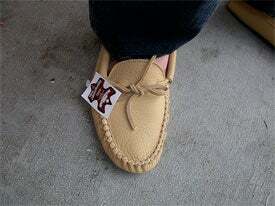 Not only does the design feature several of what the company terms "heritage callouts" — sunrise patterns, feather designs, war paint and the like — but it was specially engineered for Native American feet, which are apparently (cough) wider than average white man feet, a trait that doesn't exactly end at the ankle if ya see what we're saying. "Nike is aware of the growing health issues facing Native Americans," said Sam McCracken, manager of Nike's Native American Business program. Ha ha, "growing" problems... Okay, so: Native Americans are on the larger side, like many impoverished minorities in this country, because of a combination of economic and historical and policy-related factors you don't need me to rehash here. Which sorta prompts the question: why hasn't all that sneaker-buying made America's minorities thin? Probably because buying shoes is not usually the answer to your problems. Though it's nice that Nike's trying to spread the false hope to the poors! Although we really didn't think they could get more retarded than the time they tried to manufacture shoes their factory workers could afford. Or the time they ripped off that Minor Threat poster. So glad to know we're wrong!